What makes me happy when I take my family for dinner or lunch, they find the food is value for money and the food is absolutely delicious! I don’t need to review much about their food, in fact, they are pretty reputable in the area, with the word spread around, email exchange or speculations, in fact every night they were full, and you ought to make reservation to dine in here too. One of the long weekend I took my family to all the way to Tanjong Bungah for dinner, and this place is not any stranger to anyone that stays around the area. 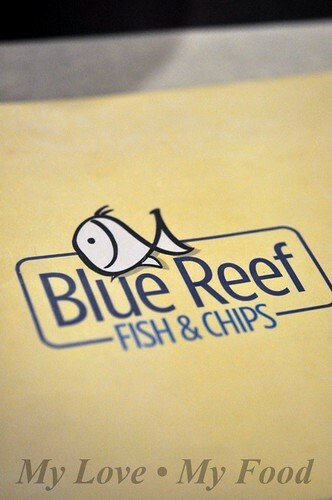 Yes, am talking about Blue Reef. What’s their signature? 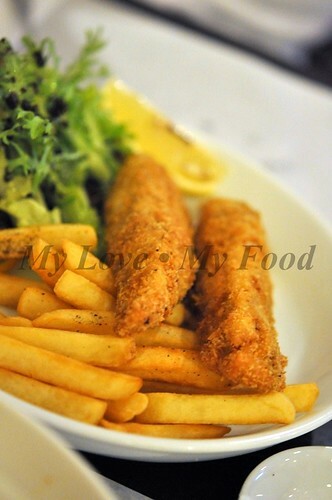 Basically Fish & Chips (RM16.00), and look at the serving, it’s basically an Aussie’s size. If you’re small eater, best to share with another person. Cuz, honestly the generosity in giving the food is honestly grateful. What they have is either beer battered or bread crumbed. 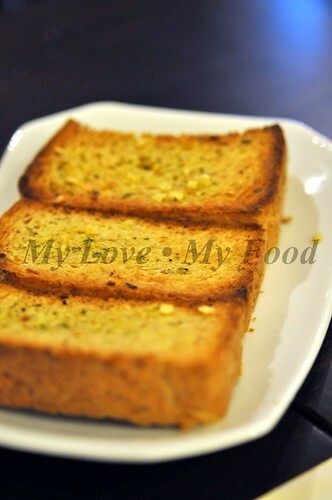 In fact, I like the bread crump version, probably due to the crunchiness. 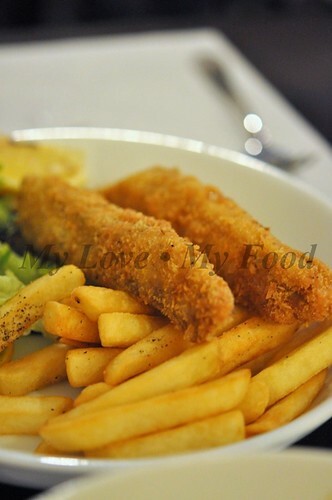 When I first took this Fish & Chips, I was pretty skeptical about the freshness of the fish, well, to my surprise, the fish is fresh and mostly are imported, and the way they deep fried, the batter lock down the freshness and the meat is tender too. It’s a must to have. 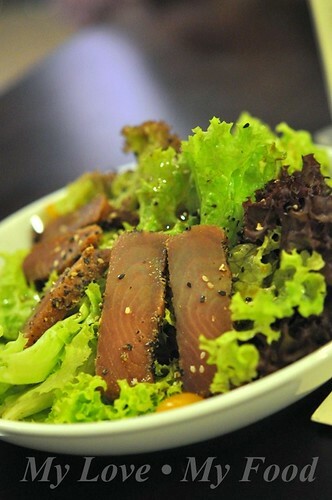 Smoked Black Pepper Tuna Salad (RM15.00) is something unique and the vegetables are refreshing despite the salty smoked tuna. It gives a pleasant combination too! What best to eat with a bowl of hot soup?? 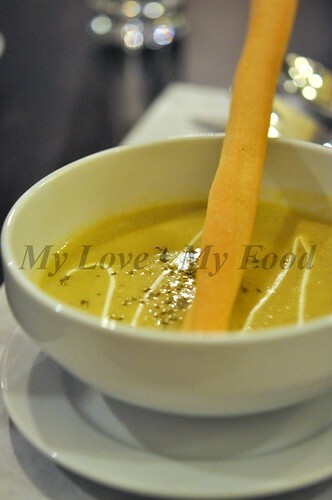 With hubby’s ordering food, he will never miss out the Garlic Bread (RM5.00) & a bowl of soup, beat it is Mushroom or even this… Pumpkin Soup (RM8.00). Aglio Olio with Prawns (RM16.00) is something new, in fact, it replaces what they earlier have, that’s Aglio Olio with Bacons. Due to the operation change in the kitchen, they have replaced with this new pasta. Well, for that matter of fact, this isn’t that bad, but a bit dry that’s all. 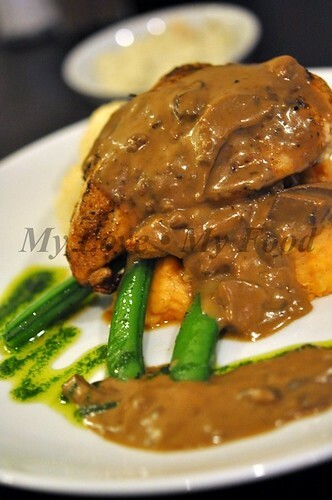 Glazed Paprika Chicken (RM17.00)… sometimes you find it weird to have chicken meal in a fishy restaurant… but this piece of chicken it’s absolutely impressing my family! The meat is tender and juicy! 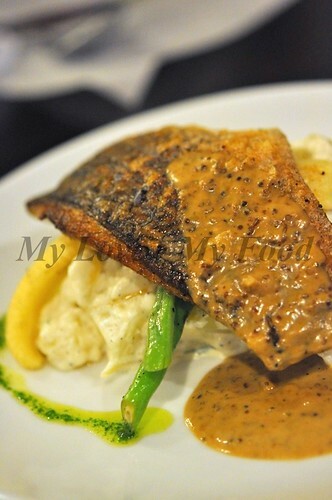 Grilled Barramundi (White Seabass) (RM19.00) is the cheaper version of grilled fish; of course, they have other choices like Garoupa, or even Alaskan Codfish. 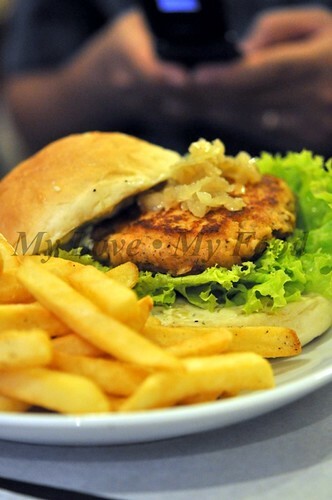 Oh ya, there’s one more item that you wouldn’t want to miss… A Salmon Burger (RM19.00)! I honestly have not seen a Salmon Burger before, not to mention to taste. But this is definitely a good one. The Salmon pâté (patty) is well cook; you would not find any dryness of the cooked paté. And it’s absolutely fragrant; I could taste some onions in it. Have you ever thought a kiddy’s size of meal? Check this out…. Kiddy’s size Fish & Chips,… it ain’t small! Right?? And it’s only costs RM10.00. Aussie serving's fish and chips, I longed for more! most of the items are similar to what we had except for the smoked tuna salad and kids meal. They are no longer using pork bacon because they are going for pork free dishes to cater to the Muslim market. And beef bacon doesn't taste good in their aglio olio pasta. ahh..another great food to hunt in pg..good good.. This is a nice place for western seafood. Generousity brings back loyal customers. hey glad to hear you liked the food. im still a fan! especially like their tuna salad and grilled fish and miso chicken! I am so going to eat here during my next visit! TQ for d heads up. but in penang... again!!! huhhh, i wanna have try! Hmm! 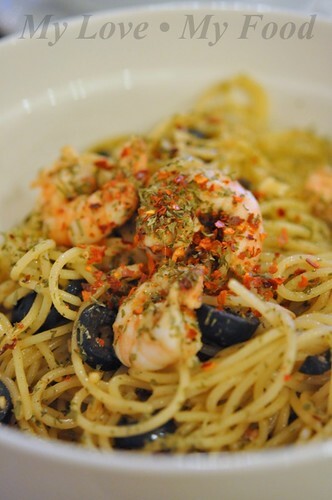 It's time for me to go and taste the prawn aglio olio! The last time I had was still bacon. haha I guess the food I has there is already outdated and yet I have not posted about it yet...the aglio olio was with bacon! And this is the place I wanted to go for so long ... Damn, I gotta find the exact directions.